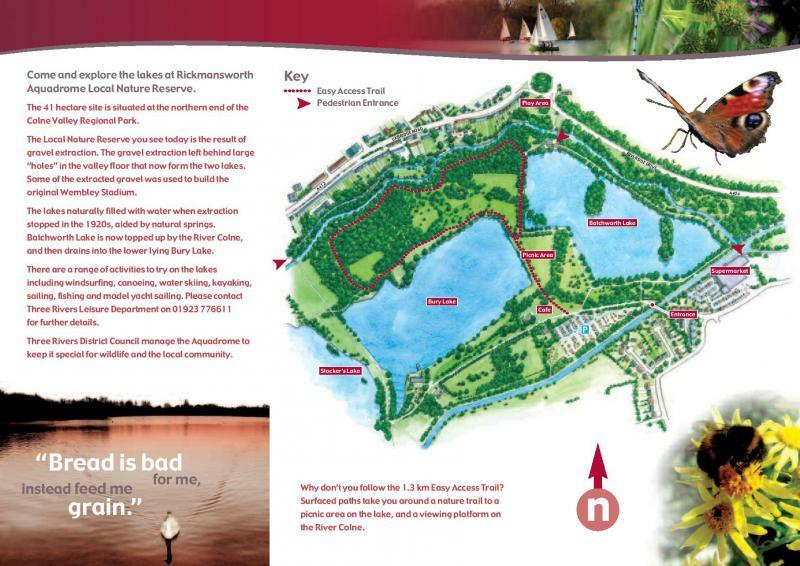 The current new five-year management plan for Rickmansworth Aquadrome. The Aquadrome covers 41 hectares and is home to a wide variety of facilities from wooded walks, lakes and a play area to a cafe and lush green open spaces. The address is Rickmansworth Aquadrome, Frogmoor Lane, WD3 1NB. Visitor opinions are very important to Three Rivers District Council. Feedback helps to ensure that the Council works towards providing the quality and facilities expected by visitors. Would you like to have your views heard? Well now's your chance. Complete the online Aquadrome survey here and help the Council improve your local open space. Paper copies of the survey are available upon request by phoning the Council on 01923 776611. There is no closing date - results will be reviewed throughout the year and appropriate actions put in to place. As a Local Nature Reserve (LNR) it is also home to a variety of wildlife and plants and with its diverse habitats is an ideal place for walks and picnics. It is often host to lots of sporting activities such as public runs, fun days and watersports. The Aquadrome LNR is open 365 days of the year (24 hours a day) and there is no admission charge. There is plenty of free parking available, including bays for disabled drivers and improvements have been made to the network of paths around the reserve so wheelchair users can get around easily. With a large car park and easy access for all, Rickmansworth Aquadrome has something for everyone. You can walk around both Batchworth and Bury Lakes - approximately 1.6km around Bury Lake and a further 1.4km around Batchworth Lake. If you are feeling really energetic then you could also walk the Easy Access Trail through the wet woodland which is around 1.3km. Whilst you're at the Aquadrome Local Nature Reserve a visit to the Cafe in the Park, which is open from 9:30am to 5pm, will refuel you! You will also find information on other nature reserves and walks in the district. If it's a sunny day a picnic in the dog free picnic area located close to the toilet facilities (which includes a toilet accessible with a RADAR key) and the Cafe in the Park, is an ideal way of relaxing for a few hours. Please note: Strictly no barbeques permitted anywhere in the Aquadrome. There is a large children's play area with lots of exciting play equipment next to Batchworth Lake, with access off Riverside Drive. At the centre of the Aquadrome are two lakes, formed by the extraction of the gravel used in the construction of the original Wembley Stadium. The Aquadrome has a vibrant atmosphere, shown by the wide variety of clubs and organisations that use the facilities at the Aquadrome. For more information regarding clubs, such as water-skiing, sailing and kayaking, please visit the Aquadrome clubs page. Please note: Anyone wishing to participate in the watersports must be affiliated to the various clubs. In addition, Three Rivers District Council organise various outdoor activities at parks and open spaces across Three Rivers. For activities at The Aquadrome, please visit events, community groups and volunteering page. Part of National Cycle Route 61 runs through the Aquadrome and this is marked on site by directional finger-posts. Cyclists are welcome to use this route. Adjacent to Bury Lake is Stockers Lake, a bird and wildlife sanctuary owned by Affinity Water and managed by the Herts and Middlesex Wildlife Trust. If you happen to see any wildlife who are in distress, danger or hurt, please contact our local RSPCA office on 0208 966 9688. To keep yourself safe, when you are in, on or beside water, always follow the Water Safety Code (pdf). If you happen to see one of the swans in danger or hurt, please contact The Swan Sanctuary on 01442 245524 or 07940 183600 with the exact location and nature of distress. For further information, please visit www.theswansanctuary.org.uk. In 2009 the Aquadrome Local Nature Reserve became an award winning open space when it received its first Green Flag Award. The award has been re-awarded every year since then. Find out why judges rate this reserve as such a special place. The Rivers District Council has worked with the Countryside Management Service to review the management plan for the Aquadrome and draw up plans to achieve the vision, aims and objectives for the site from 2013 - 2018. You can download the site management plan below. One day tickets for fishing at the Aquadrome LNR on Batchworth Lake only are available from council offices at Three Rivers House. Tickets are £5 each to adults (including OAP's) and are free to juniors of 17 and under and free to registered disabled. Tickets purchased after 4pm will be valid for the rest of that day (until dusk) and the following day. If you would like to fish at the Aquadrome LNR on a regular basis, you need to contact the Uxbridge Rovers Angling and Conservation Society, who has the rights to fish Batchworth Lake and the adjoining River Colne. Secretary: Mark Radcliffe 07957 587576. 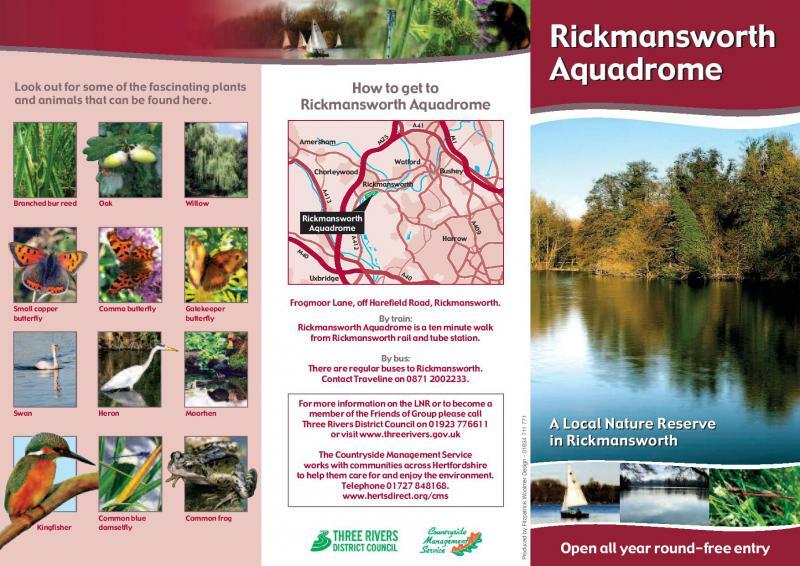 The Rickmansworth Festival takes place on the third weekend of May every year at the Aquadrome LNR. Celebrating canals, the community and the environment, the festival has been going for over twenty years and is the highlight of the town’s annual calendar and finale of Rickmansworth Week. By road: approximately 3.1 miles (5km) from junction 18 on the M25 off the A404.The Aquadrome LNR is open 365 days of the year and there is no admission charge. There is plenty of free parking available, including bays for disabled drivers and improvements have been made to the network of paths around the reserve so wheelchair users can get around easily. By tube: Rickmansworth Station is approximately 1mile away from the main entrance and car park at the Aquadrome but less than half a mile from the entrance in the play area if walking from the station. Three Rivers District Council is not only responsible for the management of our parks and open spaces, we see ourselves as guardians who promote, conserve and enhance our natural heritage, for future generations. Why not contact us to tell us what you think about our parks and open spaces on 01923 776611 or e-mail us at leisure@threerivers.gov.uk.